The proper use of military force in international relations is the indispensable subject of strategic policy. The national interests that could be promoted, protected or secured by the use or threat of military force, and how military force will achieve those objectives, should be intelligible in the military mission. So why has President Donald Trump again raised  the possibility of US military intervention in Venezuela? The impacts of military force are rarely, if ever, constrained to the battlefield. More often than not discontinuity, short- and long-term unpredictability, and occasionally revolution result. The mission defines the government’s parameters and determines the size and composition of the force, the rules of engagement, the exit strategy and, hopefully, the consequences. Conceivably any combination of objectives might be driving the Trump administration. It might be to force a humanitarian corridor to bring much-needed aid to the hungry Venezuelans, a righteous abhorrence of corrupt and illiberal autocrats, or a wish to bring the blessings of democracy. Despite the rhetoric, fostering democracy, enforcing human rights and addressing humanitarian concerns are not the drivers of US policy in Venezuela. If so, the administration would be threatening Abdel Fattah el-Sisi and Mohammad bin Salman as well as Nicolás Maduro. Human Rights Watch’s 2018 report  catalogued the corrupt and abusive practices of the dictatorial el-Sisi regime and enumerated the human rights abuses and war crimes taking place in monarchical Saudi Arabia. Yet in Cairo, Secretary of State Mike Pompeo said  meekly, ‘[W]e encourage President Sisi to unleash the creative energy of Egypt’s people, unfetter the economy, and promote a free and open exchange of ideas.’ Despite the appalling war in Yemen, corruption, repression and intolerance in the kingdom, and Jamal Khashoggi’s murder, he uncritically lauded Saudi Arabia as ‘a powerful force for stability in an otherwise fraught Middle East’. Perhaps the threat of more illegal immigrants generated by the chaos in Venezuela is behind Trump’s thinking. Or, less charitably, maybe he wants to seize the opportunity to secure greater US influence over Venezuela’s immense energy resources by installing a friendly government. Military invention in Venezuela has risks and could be potentially counterproductive to US interests. It could descend into a prolonged conflict with the Venezuelan military, or another counter-insurgency imbroglio if strong civilian resistance was encountered. In the lead-up to the 2020 presidential election, this could be a divisive issue. Other Latin American nations undoubtedly would be perturbed if the US defaulted to past patterns of military intervention and regime change. Interestingly, all of the above-mentioned possible justifications for intervention were noted in Congress’s Venezuela Humanitarian Assistance and Defense of Democratic Governance Act of 2017 . It is also of significance that the bill expressed concern that if the Venezuelan oil giant PDVSA defaulted on bond payments, 49.9% of its US-based subsidiary Citgo would fall into the hands of the Putin-connected Russian energy company Rosneft. Russia’s growth in economic and political influence in Venezuela has been also accompanied by increased Russian arms sales  and strategic deployments —an unacceptable intrusion by a peer competitor and adversary into the US’s backyard. More likely we’re seeing the reinvigoration of the Monroe doctrine  and the reestablishment of the 19th-century doctrine of spheres of influence that informed it. The threat of military action is just part of the bigger geopolitical power settlement emerging across the globe—a declaratory act of delineation, or territory-marking. As the US starts to pull out of the Middle East  and Afghanistan , distances itself from NATO  and contemplates disengaging from the Korean peninsula , Trump is sending a signal to Russia and China that the Western hemisphere is the US’s sphere of influence. In the era of declining hegemony and rising great-power competition, Russia has, in the Ukraine, Georgia, the Black Sea and Syria, already put down some forceful markers of its sphere of influence, as has China in the East and South China seas. The Venezuelan crisis will probably not see US forces in the country. (Probably, but in these times anything is possible.) Trump has speculated  that he ‘would have been a good general, but who knows?’ Maybe he would have been a good general. More to the point, perhaps he is a president-general who understands intuitively in the new geopolitical reality the strategic limitations of over-reliance on military force beyond the Western hemisphere, short of major war. Americans have more often thought military leaders make good presidents than vice versa. First Washington, then Jackson, Taylor, Grant, Garfield, Arthur, Harrison and Eisenhower all transitioned to the presidency. As general-presidents, Washington, Jackson, Grant and Eisenhower stand out for their impact on the shape of the US republic and the office of the president, and their prudent, deliberate employment of military force. Trump is not in that class. But his strategic policy might not be as incoherent as some judge . Perhaps he dimly perceives the decreasing utility of acting globally. The president-general might just be acting on an inchoate sense of the strategic logic inherent in the US becoming just one among a number of great powers each straddling and commanding a sphere of influence. Securing the US’s sphere of influence in the Western hemisphere might be the national mission. There is no military mission for Venezuela, but a national strategic objective. Maybe initiating the remaking of post-hegemonic US strategic policy will be Trump’s most memorable achievement. Mike Scrafton is a former senior Defence executive, former CEO of a state statutory body, and former chief of staff and ministerial adviser to the defence minister. 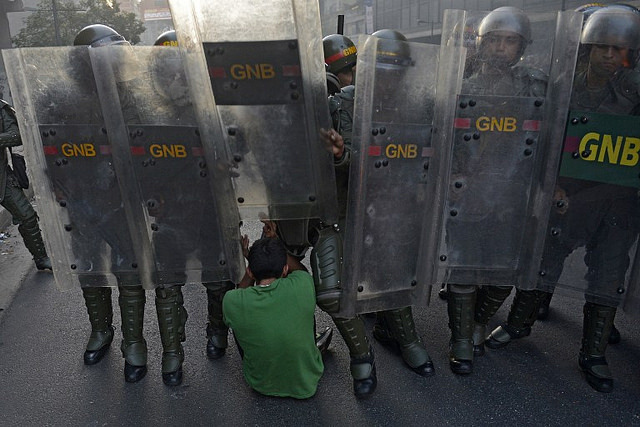 Image courtesy of Diariocritico de Venezuela on Flickr.